Berries... and potato salad... mixed together?! Yeah, the same thoughts ran through my mind when I was asked to test run a recipe created for the Dairy Farmers of Canada by Chef Michael Allemeier of SAIT. The 2014 Real Cream program brought four Canadian chefs together to reinvent eight classic recipes with a seasonal cream & berry twist. It would seem to be an easy task given that cream and berries pair so well, but savoury berries and cream would pose a bit of a challenge. 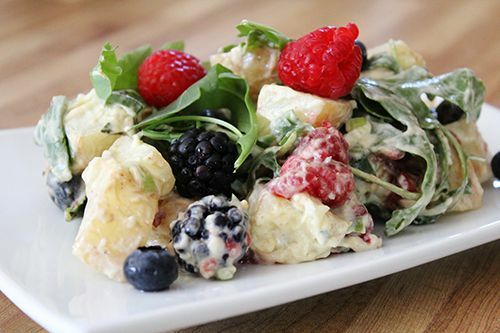 Chef Allemeier rose to the occasion and came up with his Berry Delicious Potato Salad. I personally enjoy potato salads, but the only fruit I've ever put in mine is apples for a bit of crunch and sweetness. I was up for the test to see if the berries really could be combined in a tangy potato salad. My boyfriend even went so far as to say I would ruin the salad with the berries, but in the end he loved it! What I love about this recipe is how readily available the ingredients are in the summer months. Practically every ingredient required for the recipe is always stocked in my kitchen or growing in my garden in the summer so I could theoretically whip this potato salad up whenever I please. The recipe is simple and straightforward, so easy to put together, and the berries really make the dish pop both in aesthetic and flavour. This side dish served cold is perfect for summer picnics and BBQs, and will definitely be the talk of the party. 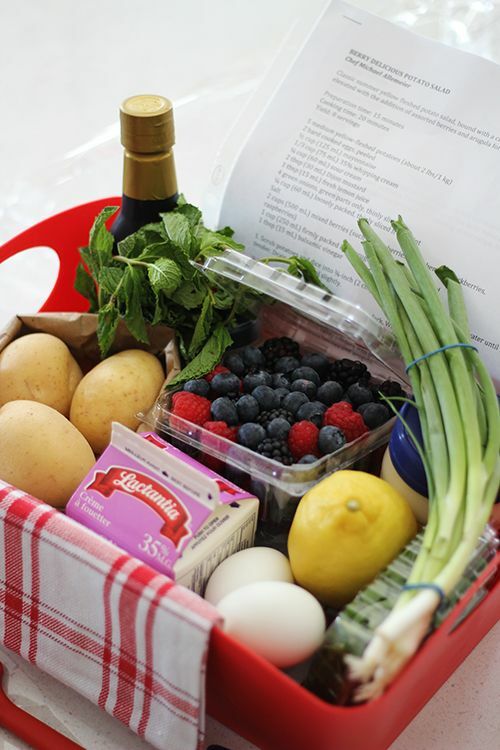 Classic summer yellow fleshed potato salad, bound with a creamy hard-boiled egg dressing, elevated with the addition of assorted berries and arugula for an unexpected twist. 1. Scrub potatoes and dice into ¾-inch (2 cm) pieces. Cook in large pot of salted water until tender. Drain well; let cool slightly. 2. Meanwhile, in a large bowl, mash eggs with a fork. Whisk in mayonnaise, whipping cream, sour cream, mustard, lemon juice, onions, and mint, until creamy. Add warm potatoes to dressing; season to taste with salt. Cover and refrigerate until serving. 3. To serve, in a medium bowl toss berries, arugula and balsamic vinegar; reserve some of the berries and arugula. Fold berry mixture into potato salad. Serve in a bowl or on a platter; garnish with reserved berries and arugula. Chef’s Tip: There are many varieties of yellow-fleshed potatoes. They have a wonderful flavour and texture, perfect for potato salad. Look for Yukon Golds, Agria and Kennebec potatoes – all of these are perfect for this salad. For prep/cooking time and nutritional information, please click here. Happy cooking! Your boyfriend sounds like an idiot. ohh this sounds like such a nice salad and it's cool that you have some of these ingredients in your garden! I think your salad is very nice and I have to disagree with your boyfriend about the berries haha! Yummy! Wholesome, tasty and berries are a great touch! This looks so good. I would've never thought of using berries in a potato salad.